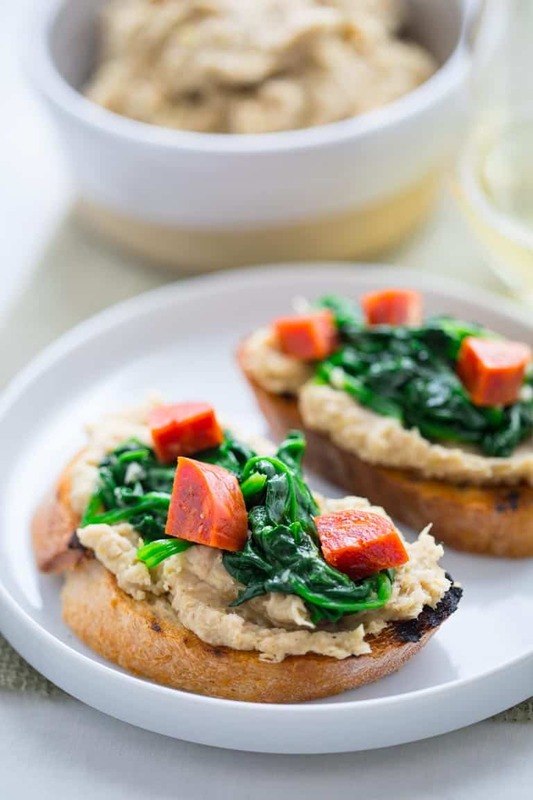 These super versatile and yummy White Bean Bruschetta with Garlicky Greens are the perfect little Italian-inspired appetizer for your spring and summer get-togethers. And they come together in just 30 minutes! I originally shared this recipe on June 10, 2012. I have updated the images and some of the text today. 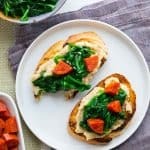 This is a classic Italian grilled bread antipasti with white bean and leek puree that can be easily be adapted to whatever you have on hand. Like I had some pepperoni hanging around and decided to chop that up and add it to the mix and it was such a delicious and welcome addition. 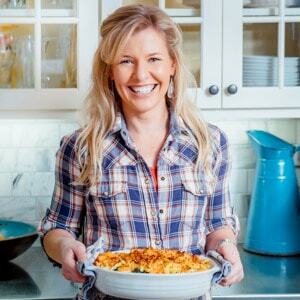 Although we still have snow on the ground here in Vermont that doesn’t stop me from dreaming about all the potlucks, picnics, al fresco dining and casual summer entertaining events coming our way very soon (fingers crossed). So it is important to have a few simple noshes in your recipe repertoire. Here is one I go to again and again because it is awesome. First I chopped up some leeks which I had left-over from a photo shoot. If you haven’t used leeks before, you can always check out this post here to see the step by step photos of how to clean a leek. Normally I would have used slowly cooked onions as the base of the puree, but like I said this recipe is versatile. We also had baby spinach this week in our CSA, so that’s what I used for the garlicky greens. Though beet greens and chard would be great too. If you use chard, finely chop the stems and add them into the Dutch oven with the garlic. Folks, I will tell you one of the best things about this recipe is how everything comes together so well. 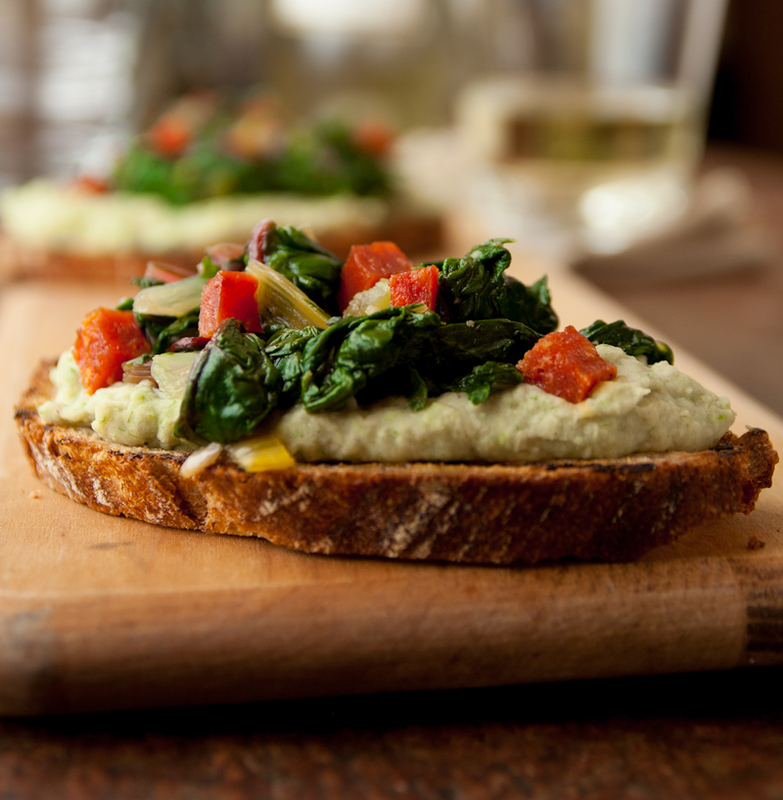 The creamy, almost buttery, white bean and leek puree spread on top of the crispy grilled bread is amazing. Gah, the char taste, it’s such a great contrast with the sweetness of the bean puree. But then you top it with those bright garlicky greens and that salty, smoky pepperoni and WOW you really have something so special! 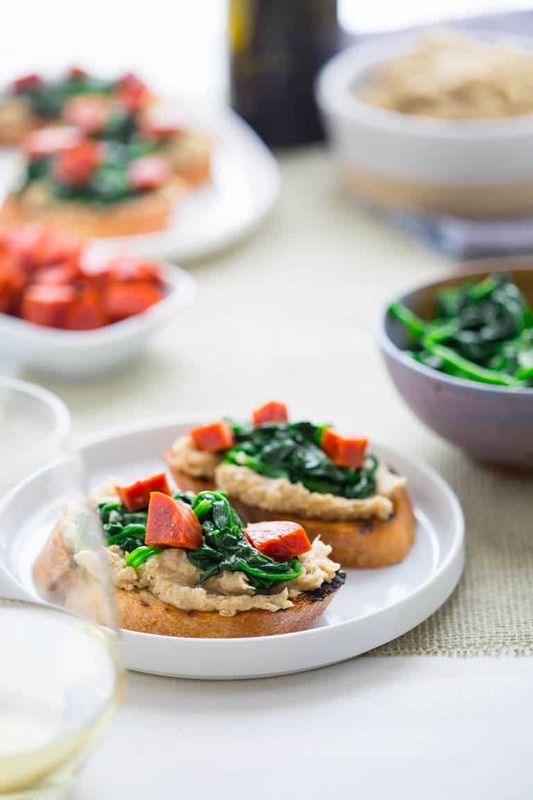 These super versatile and yummy White Bean Bruschetta with Garlicky Greens are the perfect little appetizer for your Spring and Summer get-togethers. And they come together in just 30 minutes! Place 2 tablespoons oil in a medium skillet followed by leeks, 1 tablespoon garlic, 1 ¼ tsp salt and ½ teaspoon pepper and place over medium heat. Cook, stirring often until the leeks are softened but not browned, about 5 minutes. Stir in beans and cook, stirring often until heated through, about 3 minutes. Transfer to a food processor and puree until smooth. Heat 2 tablespoons oil in a large Dutch oven over medium heat. Add the remaining 1 tablespoon garlic, chopped greens’ stems, the remaining ¾ teaspoon salt and the remaining ¼ teaspoon pepper and cook, stirring often until the garlic is fragrant and the stems are softened slightly, 1 to 2 minutes. Add chopped green leaves and stir until combined with the garlic mixture. Cover, increase heat to high and cook until the greens are wilted and tender, about 2 minutes longer. Remove from the heat. Just before serving, preheat grill to medium heat. Meanwhile, lightly brush the remaining 1 tablespoon oil over the baguette slices and grill over medium heat until lightly toasted. 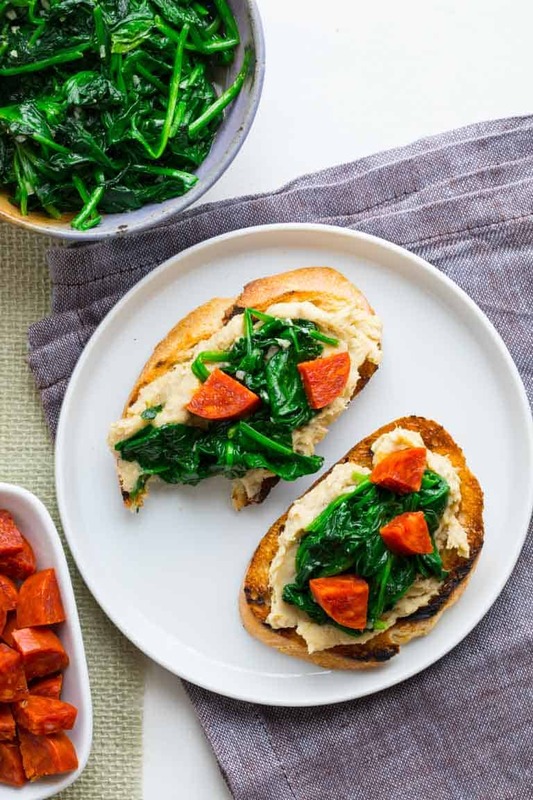 Top the grilled bread with the puree, the greens and pepperoni. 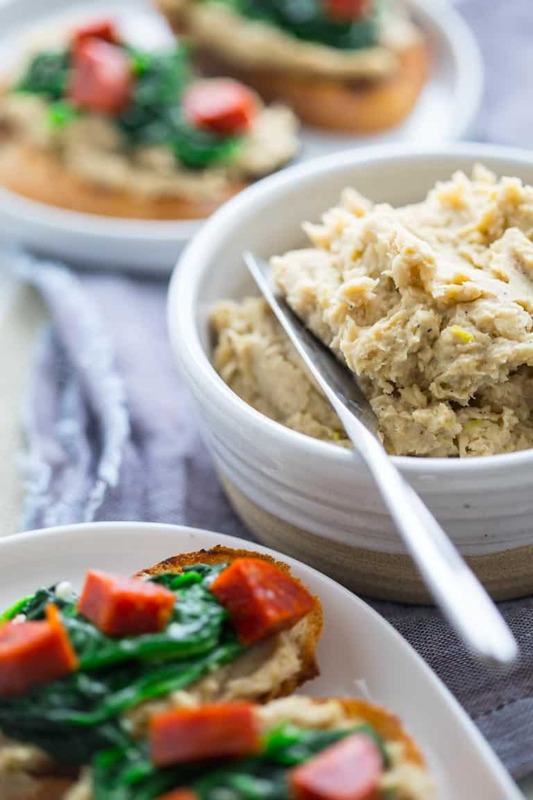 You can make the white bean puree ahead a few days. And the greens as well. The grilled bread is best if you can make it shortly before serving. 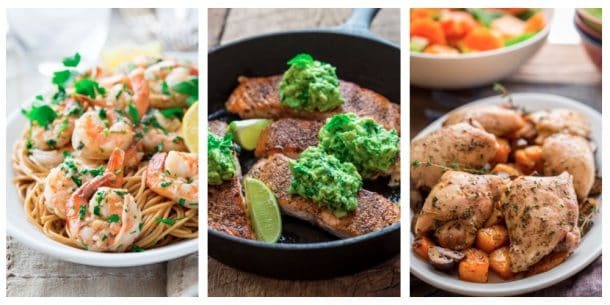 I made this recipes a couple days ago and we loved the left-overs cold. I ended up reheating the white bean puree in the microwave to soften it, but it is also great cold. I hope that you enjoy it! 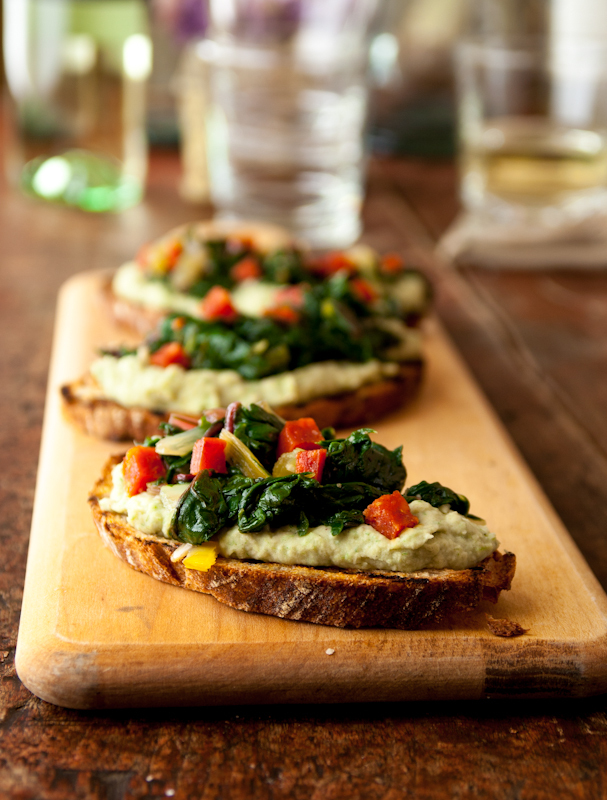 I love toasts for appetizers breakfast, lunch or dinner. 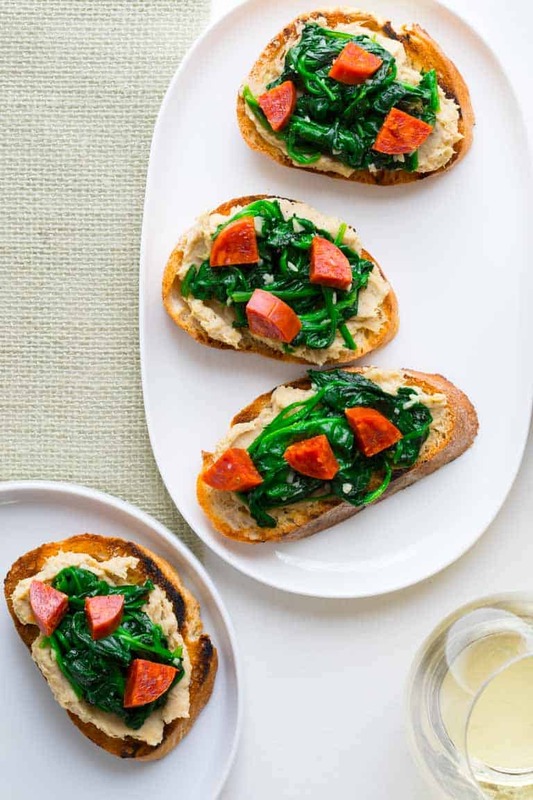 Your crostini look really good and I haven’r tried garlicy beans yet! Thank you. 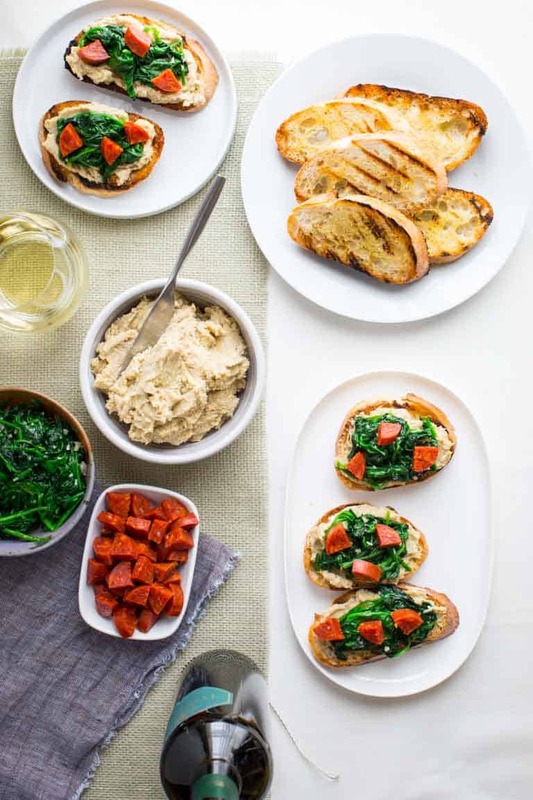 I spy a bottle of wine in your spread. That is EXACTLY how I would eat this! It’s a great party food! I will have to make a big platter of these for Easter! 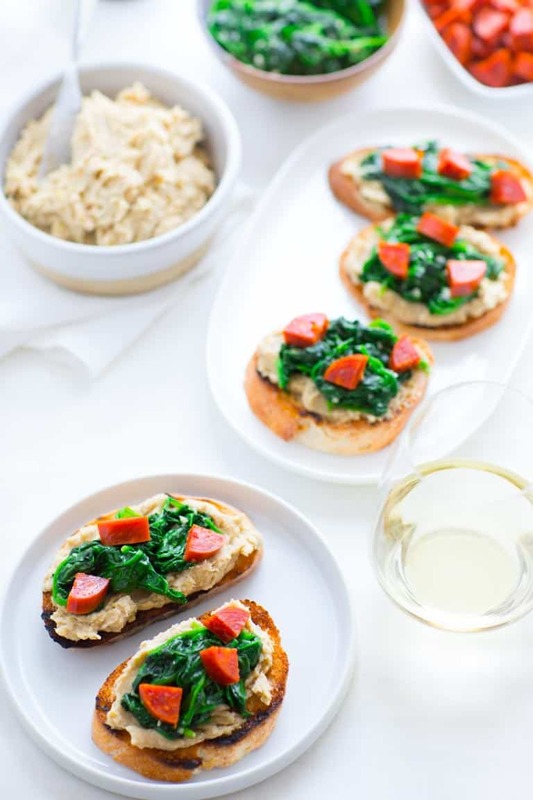 They will make a great appetizer option! That would be awesome Haley! Love this! It’s like an Italian hummus! So creamy and yummy! Yes! 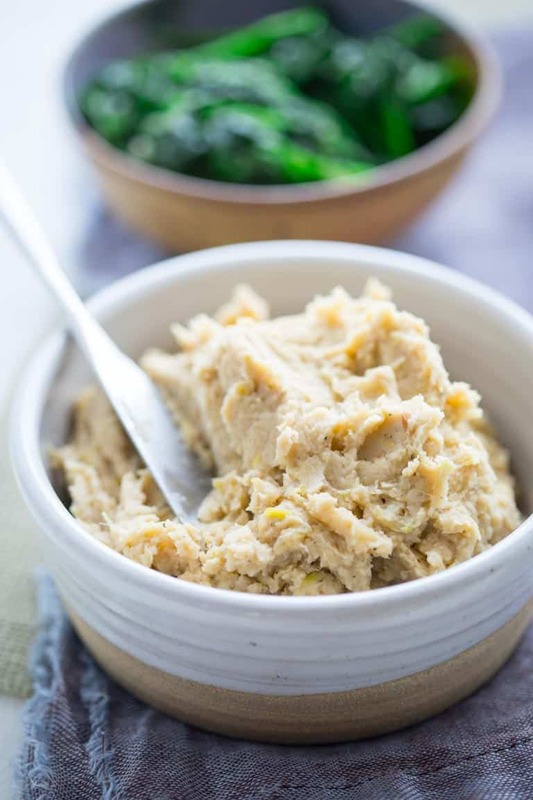 White bean puree is a classic for sure. I think this sounds like something one would be happy to always have on hand. Sounds delicious and I love your combination of ingredients. They’re so pretty together, too. I loved the left-over white bean puree. Thank you Valentina!